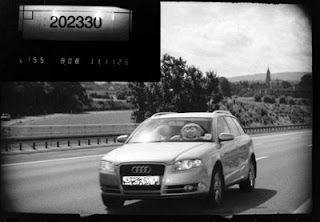 German traffic police are looking for a speeding Muppet. An Audio A4 Avant has been repeatedly photographed speeding on speeding cameras. The speed cameras in Germany take pictures of drivers who sit on the left side of the car, so UK cars cannot be identified. This ingenious driver has strategically placed Animal on the left side of his car.